PHOTO COURTESY A24 Charlie Plummer in a scene from "Lean on Pete." The fourth film from British writer-director Andrew Haigh ("Weekend," "45 Years"), "Lean on Pete" is his first feature to be filmed in America. And the story it tells seems to be a quintessentially American one: a simple tale of a boy and his horse. But it quickly grows to be much more than that, and the film upends our expectations for how this type of story typically plays out. 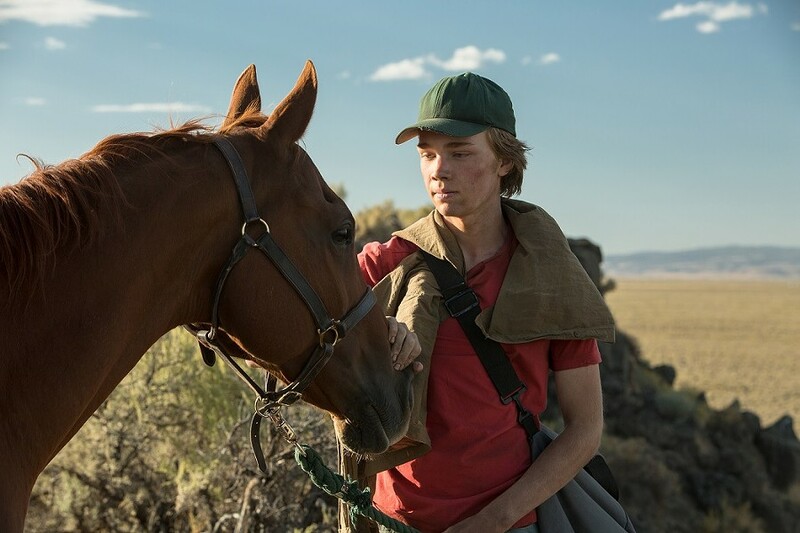 Based on Willy Vlautin's 2010 novel, "Lean on Pete" is a moving and often heart-wrenching story that works to avoid false sentimentality, but is told with empathy, humanity, and ultimately a hard-won sense of optimism. Charley (Charlie Plummer, "All the Money in the World") is a 15-year-old boy who's recently moved to Portland, Oregon with his ne'er do well father (Travis Fimmel). A working class family, they've clearly spent a lot of time moving around, never settling in one place for too long. As he waits for school to begin, Charley's left on his own most days and eventually finds a job working with racehorses at a stable run by the unscrupulous Del (an excellent Steve Buscemi). As the boy learns the ins and outs of tending to the horses, he takes a particular liking to an aging quarter horse named Lean on Pete. He quickly forms a bond with the horse despite the warnings of Bonnie (Chloë Sevigny), a sometime jockey for Del's horses, who advises him not to get attached to the animals. As she repeatedly tells him, they're not pets. But Charley only grows closer to Pete, especially after his father ends up hospitalized following a brutal run-in with the angry ex-husband of the woman he's been seeing. Del feels no hesitation in shipping his horses off to Mexico once they've outlived their usefulness. And when it seems that may soon become Pete's fate, Charley impulsively steals him away, taking off in one of Del's trucks, hoping to make his way to Wyoming. There he hopes to find his estranged aunt, who he had a close relationship with as a child. The film delivers a breakout turn for young Plummer, who gives a remarkable, naturalistic performance. Much of the role is internal; Charley isn't much of a talker -- though he gets a few monologues in which he bares his heart to Pete while they wander through the desert. He conveys the boy's innate decency, and he makes you want nothing more than to give him a hug and tell him things will be OK, even if you're entirely unsure through much of the movie whether that will actually be true. We fear for him, though we can see that Charley's a resourceful kid. It's obvious that he's had to be, after more than his share of days spent on his own with no on watching out for him. As the film moves into its more challenging second half, Haigh captures the way in which circumstances can suddenly conspire to leave a person homeless before they're entirely aware of what's happening. As it goes on, the film becomes less about the horse itself than what he comes to mean to this lonely boy, who is searching for some sense of community. The film is gorgeously photographed by Danish cinematographer Magnus Nordenhof Jonck, though in such a way that the beauty of its expansive Northwest landscapes seem to emphasize the isolation and loneliness of the characters who exist within them. Haigh puts his audience through the ringer, but his film is never depressing. He allows us to feel as though we've been through what his characters have, and come out the other side. A word of warning here: if you have a difficult time seeing animals put through hardship on screen, this might not be the film for you. In a word, "Lean on Pete" is devastating. It turned me into a ball of tears on more than one occasion, and I say that as someone who doesn't often cry at movies. Haigh keeps a certain distance from the events that unfold. The method keeps the film from feeling exploitative, but dilutes none of their power from what's certain to be among the best films of the year.